The complete Brilliant Classics recordings of a masterful modern maestro with a touch of genius in little-known repertoire. In the extensive booklet interview, the conductor Theodore Kuchar recalls how, as a boy growing up outside Cleveland to Ukrainian-born parents, he learnt his music at the feet of Lorin Maazel, sitting in the cheap seats every week. Sound training and determination took him to Helsinki as violist and part-time conductor for the Finnish Opera, thence to Brisbane for his first musical directorship in charge of the Queensland Philharmonic. 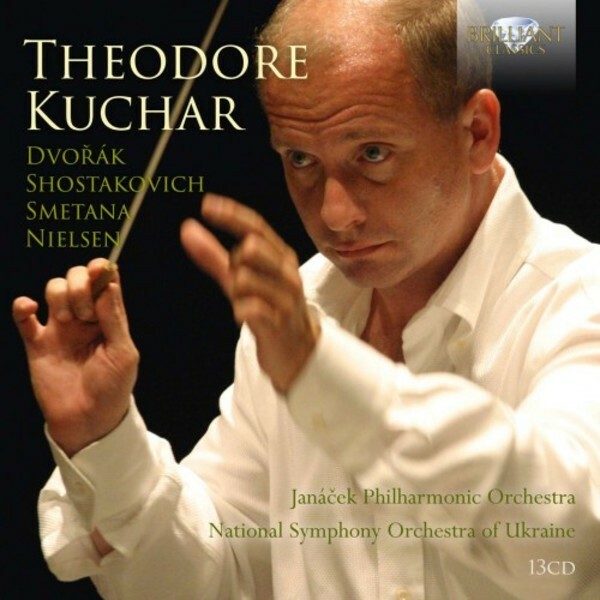 In the early 2000s Kuchar also worked regularly with the Janáček Philharmonic Orchestra based in Ostrava, formerly known as the Czech Radio Orchestra. Together they recorded the major � and most of the minor � orchestral works by Smetana, the best-known tone-poems of Dvořák and even the complete symphonies of Carl Nielsen, which became a critical hit. Since then Kuchar has conducted orchestras throughout Europe, Asia and the Americas. As music director of the Orquesta Sinf�nica Venezuela he led a vibrantly colourful collection of Latin-American orchestral classics (by Ginastera, Moncayo and Revueltas among others) for the last disc on this retrospective, recorded in 2011.